A magnificent small cigar unknown to the general public. It must be called a Short Corona because it has the ring gauge of a Corona, only it's shorter. A small but powerful cigar delivering woody leathery notes. A must try especially if you like the Ramon Allones Small Club. Does not look do impressive to the eye, but the construction is always excellent. 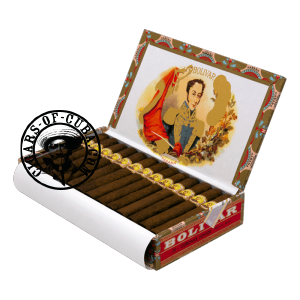 This cigars starts off directly in typical Bolivar manner. Powerful, with aromas of earth and leather. Finale is very strong, almost harsh. This is a short smoke for the experienced smoker only.